Ever since I have been engaged in technology enhanced learning (at that time, most of it was called e-learning), I have been suspicious about viewing learning only to happen in formal, dedicated learning activities (such as university courses, business trainings and seminars – or e-learning courses). Jay Cross has made the 80-20 paradox popular: 80% of learning at the workplace happens informally, while only 20% of budget goes into these activities. Within Learning in Process, we had tried to integrate more formal with informal learning activities through a recommendation approach that blended formal and informal opportunities. This has led to a more holistic perspective to the various forms of learning: the knowledge maturing model conceptualized the characteristics of learning dependent on the maturity of the knowledge an individual interacts with, from creative idea generation to teaching novices about standardized topics. It has helped to understand how diverse approaches to supporting learning of employees fit together, such as human resources development, knowledge management, e-collaboration, and idea management. We have explored this from a empirical and design perspective within the four years MATURE IP, which is now continued in the Knowledge Maturing Consulting Networkfrom a practical perspective. In terms of organizational contexts, we tend to think about larger organizational entities. But the true backbone of our economy are small and medium-sized enterprises (SMEs), which themselves are a diverse group, but share the fundamental need to cooperate with others, to form networks of mutual benefit in various areas. This has been very successful in the field of formal training, such as vocational training. But so far little has been done to address the 80%: informal learning. The major challenge to support informal learning at the workplace is scaling. At the moment, informal learning at the workplace works well in small groups, but has its difficulties in larger contexts, but at the same time offers huge potential through sharing and peer production. 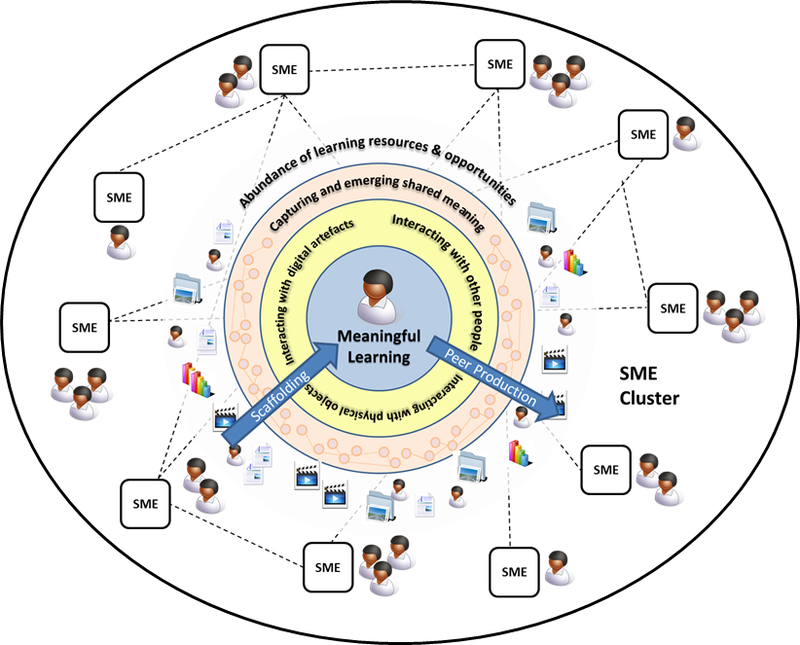 How can we support individuals in finding their way in the huge abundance of material available in SME clusters? How can we improve the capabilities of individuals to create, improve, and remix materials that are meaningful and of value to others? This will be the research theme for the Learning Layers IP that has officially started on November 1, but for which I have been busy over the last two months at least. Tomorrow will the physical kick-off meeting (after a Flashmeeting pre-kick-off last week). I am looking forward to working with all the others on this exciting topic and to continuing the research I have been pursuing for now over ten years – now also at my new position at Karlsruhe University of Applied Sciences.